Finally, I’m looking out the window and seeing the sun shine. Soon the snow will be gone, the grass will be green, flowers will be blooming. Spring is a time of renewal, a season to observe how life comes back in nature, color explodes where its been grey and bleak and after these long months of being indoors we will all enjoy the spring air. For my family and I, April is also a reminder of a time when my husband wasn't sure if he would see the renewal of spring. He, along with over 120,000 people in the US, was waiting for an organ transplant. April is National Donate Life Month, and efforts are underway to help all of those, including the 10,509 New Yorkers who are waiting to see if they will live for another spring season. LiveOnNy recently launched their new campaign to recognize the beauty of New Yorkers and appeal for them to help each other through organ donation. Howard was diagnosed with Pulmonary Fibrosis, a terminal lung disease in 2006. He was listed on the transplant waiting list in the winter of 2011, we weren't sure what would happen that spring as he waited for a lung transplant. We remember those few months well, and are very grateful that Howard received a double lung transplant a few months later in August. I have posted before about Share Life NY, our family’s efforts to raise awareness of the dire condition of transplantation in the US, particularly in NYS. The state ranks last, 50th in the country of registered donors, and in NYS only 23% or the residents are registered vs. 47% in the rest of the country. This month, as NYC comes to life with its unique and wonderful energy, I would like to shed light on the work of LiveOnNY, the New York City based Organ Procurement Organization that coordinates organ donations within New York State. (formerly NYODN) and their wonderful efforts to help build the donor registry in the New York area. Their new campaign focuses on NYC, its icons and the caring of its residents. Long Live New Yorkers...Long Live New York! Waiting, is a favorite image also taken by Zaro at Grand Central. We have featured this photo as an analogy for organ donation for all those on the “waitlist” for transplantation. to a birds eye view of Washington Square Park. also from this series, the statue sits among the commuter commotion, Buddha and Grand Central RE along with Share Life NY supports LiveOnNY as they celebrate New York and urge New Yorkers to learn more about the issue of organ, eye and tissue donation. Each donor can save up to 8 lives and greatly improve the lives of up to 50 people. In NY State someone dies every 15 hours while waiting for a transplant, there are not enough donors for the number of people waiting. We are grateful that Howard’s donor made the decision to join the registry. 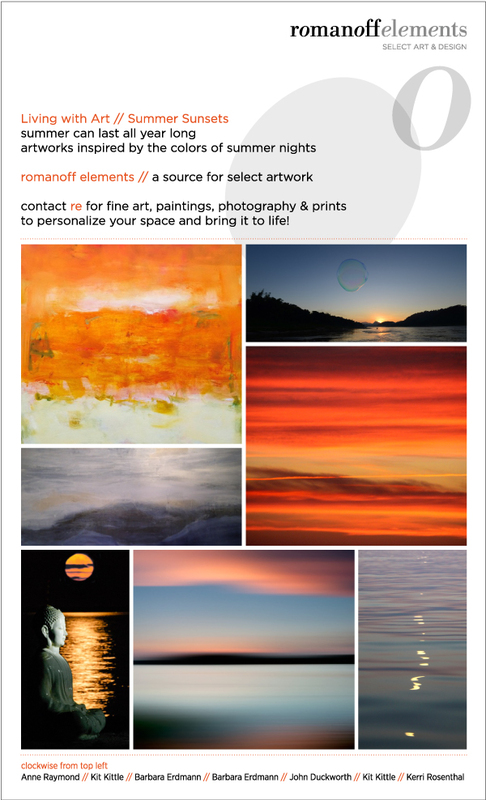 During the month of April, Romanoff Elements will donate a portion of sales to LiveOnNY. We hope that others can be as fortunate as Howard and enjoy a second chance of life. If interested in more information about organ donation, or to register to be a donor, please go to ShareLifeNY.org or DonateLife.net to find your state’s registry. If you are in New York State, you can register here. Enjoy the warm weather, spring and the renewal that it brings. Mother’s Day was initially called the “Second Sunday of May” in 1908. One woman decided that mothers should be celebrated and “honored for the sacrifices they made for their children”. Anna Jarvis spent several years campaigning for this, and in 1914, President Woodrow Wilson made it official. Anna gained early financial support for her idea from retailer John Wanamaker and the first official celebration was at Wanamaker’s Dept. Store in Philadelphia. He cleverly saw the potential. According to a recent Forbes article, 19 billion dollars will be spent this year, but at the top of the list (after cards) are flowers, 85% of women will receive them! Exactly a century later, Mother’s Day is now celebrated throughout the world. Since it is spring, the day is synonymous with flowers. For me, that relates to the varied and individual ways that artists interpret the natural beauty of flowers, their shapes and colors. I recently met Vermont based artist Deborah Falls. Deborah has created a process using dyes to paint on silk, “to capture and portray the sense of beauty and wonder” that she experiences in her garden. Nancy Woodward has developed another individualized approach to capturing what she sees in nature. She combines traditional photography methods to create an image and then uses the digital darkroom to “alter the color palettes and bring new realms in to view." Artist Christine Triebert uses an unusual technique in her Cameraless Series. I have admired her work at the Architectural Digest Home Show for several years and we recently spoke about her botanical images, photographs made without a camera. These minimal black and white Shadowgraphs are created by capturing the shadows of the objects on paper negatives in the darkroom. Painter Kerri Rosenthal, with her spirited approach to color, is recognized for her pop-art inspired Flower Bomb Series, filled with fun colors and combinations. As I wrote in a previous post, Kerri’s work comes from deep within, she has an innate sense of color and appeals to her clients’ desire for work that makes them smile. Wendy Shalen is an artist who works in many mediums and adds to her watercolor series, “Working Women” each summer. The colorful paintings capture the “hard-working women gardeners in Martha’s Vineyard who each summer plant, harvest and collect spectacular flowers which they use to create gorgeous bouquets.” Wendy’s expressive work captures these women, their work ethic and the beauty of the flowers. Anne Raymond is another artist influenced by nature, who expresses herself in abstraction. The Flare Series, is a group of paintings on paper with vibrant color and composition. These prints, or monotypes, are one of a kind. When I first saw these, I loved the bold combination of fuchsia, orange & red softened with a bit of white...a strong composition, with a feminine feel. These two paintings from the Flare Series look great placed in the just opened chic design studio, Get A Room, in Armonk, NY. Interior designer Laura Michaels, created the white shop to be a background for the colorful art and beautiful mix of home accessories and furnishings. Anna Jarvis initially, “conceived of Mother’s Day as a day of personal celebration between mothers and families. Her version of the day involved wearing a white carnation as a badge.” I think she chose early spring as it is a beautiful time of year, flowers are blooming and life begins anew. I hope you enjoy Mother’s Day!